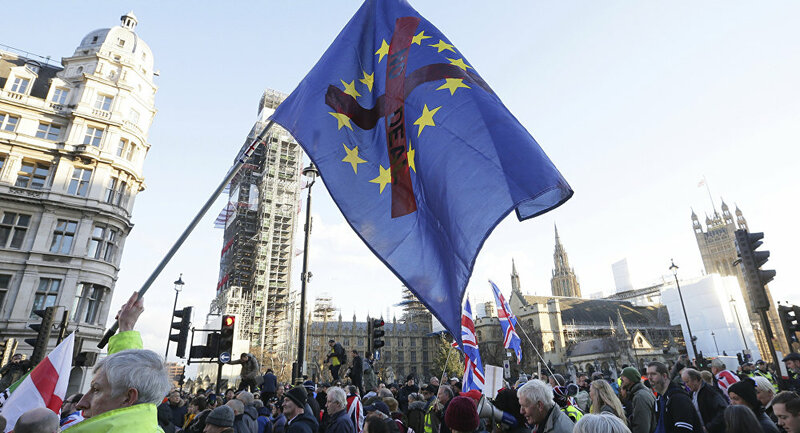 MOSCOW (Sputnik) - Over 50 percent of UK citizens want the country's withdrawal from the European Union to be delayed, a poll, which Birmingham-based polling agency BMG Research carried out for UK newspaper Independent, revealed on Sunday. As many as 53 percent of respondents believe that UK Prime Minister Theresa May should delay Brexit opening door either for a second referendum or for continuation of talks with Brussels. While 49 percent of those surveyed believe that a no-deal Brexit will result in an economic catastrophe for the country, 33 percent would back it. Since the UK Parliament is set to debate a Brexit motion on February 14, 53 percent of respondents believe that May will fail to get her plan passed, and only 22 percent feel that she will succeed to do so. The survey was conducted among 1,503 adult respondents across the United Kingdom on February 4-8. The United Kingdom is set to leave the European Union in late March. The withdrawal deal, which the two sides have reached, has not yet been approved by UK lawmakers, with the Irish border backstop being the stumbling block. Both London and Brussels are therefore concerned over the possibility of a no-deal Brexit.